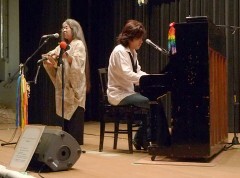 Michihiko Ota (right) playing a piano from Hiroshima with guest singer Misako Koja. On January 29, at the Okinawa Prefectural Peace Memorial Museum at Mabuni, Itoman. On January 29, a concert using a piano that was damaged by the atomic bombing of Hiroshima was held at the Okinawa Prefectural Peace Memorial Museum in Itoman. Michihiko Ota, who lives mainly in Okinawa and the Kanto region, and several other musicians performed. Okinawan singer Misako Koja, and Kajimai a drum and kobudo (traditional martial arts) group awarded a grand prize in the World Eisa Festival 2011, also appeared as guest performers. The piano’s resounding sound lingered in the site of some of the bloodiest combat in the Battle of Okinawa. Fifty-nine year-old Hiroshima piano technician Mitsunori Yagawa acquired the pianos from survivors of the atomic bombings and restored them. Now he maintains the pianos and uses them in performances across the country. This is the second concert held in Okinawa since 2007. He has four such pianos and the one used in the concert was located 1.8 kilometers from the epicenter at the time of the explosion on August 6, 1945. That is the shortest distance among the four pianos.